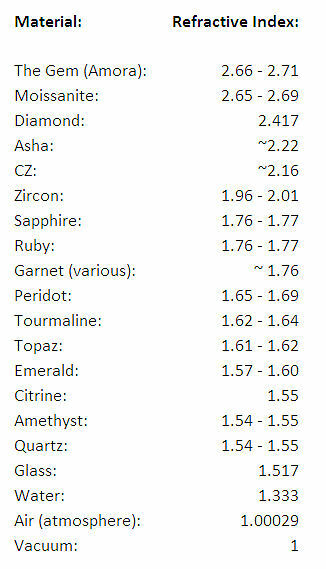 Below is a listing of various gem's 'refractive index' or 'potential for brilliance'. Refractive index (or R.I.) is a measure of how much light is slowed/bent as it passes through a material. A higher value, or more 'bending power' means greater ability for the gem, with proper cutting, to re-route light back out to the observer rather than passing through the gem to the backside, and thus creating more total brilliance. A lower value means more light will 'pass through' or create a 'window' or see- through zone, as you tilt the stone or view it less than straight on. Thus, less brilliance because more light is simply escaping out the back of the gem rather than being captured and returned back out the front for you to see as light play and sparkle. Thus, a gem's refractive index is very much a measure of it's expected brilliance (assuming optimal cutting which must use matching angles and symmetry, ala H&A rounds, to maximize it). The Amora Gem is the most brilliant gem of all, and a vacuuum by comparison has no brilliance (which is why it is the base measure of 1). (Note that when a value is listed as with two values with a hyphen, it means the material is doubly refractive. In other words, the value from light entering the side is different than light entering the top. As you can see, more gems are doubly refractive than not).